This webpage was originally produced in 2016 as a booklet for Officers joining The Royal Scot Borderers, 1st Battalion The Royal Regiment of Scotland (1SCOTS) for the first time. Its purpose was to tell the story of the background to, and provide information on, the individual items of Royal Scots silver passed to 1SCOTS on their formation. It was not until the general introduction of Officers’ Messes at the end of the 18th Century, although beforehand some Regiments, in particular the Guards, had had them, that Regiments began to collect silver. In the case of The Royal Scots the first mention of an Officers’ Mess was in 1803 on the Island of Antigua. A Mess Minute Book dating from 4 June 1812 in Antigua, now in the Regimental Library, starts with new Mess Rules and refers to existing ones. Silver usually belonged to the individual Battalion rather than the Regiment as long as that Battalion existed. On disbandment of a particular Battalion the Mess silver was either placed in the care of Regimental Headquarters, as happened with most of the Militia or Territorial Battalions, or passed to a successor Battalion, such as on the merger of the 1st and 2nd Battalions in 1948, or to 1 SCOTS in 2006. Apart from the silver transferred to 1 SCOTS there is, therefore, a substantial holding of silver within the Regimental Museum in Edinburgh Castle. Some of the more interesting or historically important items are on display and the balance is in the Reserve Collection. Much of the latter came from the 3rd Militia Battalion, formerly The Queen’s Regiment of Light Infantry Militia, whose Colonel for over 40 years was The Duke of Buccleuch. The officers were a wealthy lot who, on retirement, often presented their Regiment, and latterly the Battalion, through the Colonel, with some fine pieces of silver. An example, with 1SCOTS, is an oval cigar box. The Royal Scots Club in Abercromby Place, Edinburgh (The Regimental WW1 Memorial), also has a substantial holding of silver, much of it from former Territorial or WW1 Battalions. The story of the 2nd Battalion silver in WW2 is interesting. The Battalion had been stationed in Hong Kong from 1938. In 1940, after Dunkirk, it was realised that Hong Kong was isolated and virtually indefensible. It was decided that the silver, and the Colours, should therefore be sent for safekeeping to the Hong Kong and Shanghai Bank in the believed impregnable ‘fortress’ of Singapore. After the fall of Singapore in February 1942 the silver was found by the Japanese who did not loot it but kept it in its boxes. Just before the end of the War a Japanese Kempetei (Military Police) Colonel moved the boxes to another small (Dutch) island, Kundar, south of Singapore. On 24 September 1945, nine days after the Japanese surrender in Singapore, a recently released POW, Major MCff Sheppard, visited this island to take the surrender of the small Japanese garrison. At the end of a long day he noticed a hut which had not been searched. The Japanese Colonel claimed there was nothing in it and, sure enough, the first room was empty. There was, however, an inner, heavily padlocked, door. The door was forced and inside were found a number of boxes. When opened these were found to contain silver from The Royal Scots and The Argyll and Sutherland Highlanders (whose 1st Battalion had been stationed in Singapore since before the start of the War and, after a most gallant fighting withdrawal down Malaya, had been forced to surrender with the rest of the Garrison in February 1942). The silver was taken back to Singapore where The Royal Scots element , virtually complete, was handed over to Captain RM Crockatt (son of Brigadier NR Crockatt, Colonel of the Regiment 1946-55) who was serving on the staff of Headquarters Fourteenth Army at the time. The silver was subsequently returned to the 2nd Battalion. By a further coincidence Major Sheppard, who found the silver, had a brother Frank who was a Royal Scot. The oldest piece of Officers’ Mess silver in the Regiment today is a superb soup tureen made in 1812 by the famous silversmith of the time, Paul Storr. At that time the 1st Battalion had been stationed in Demerary and Essequibo, modern day Guyana, since 1804. 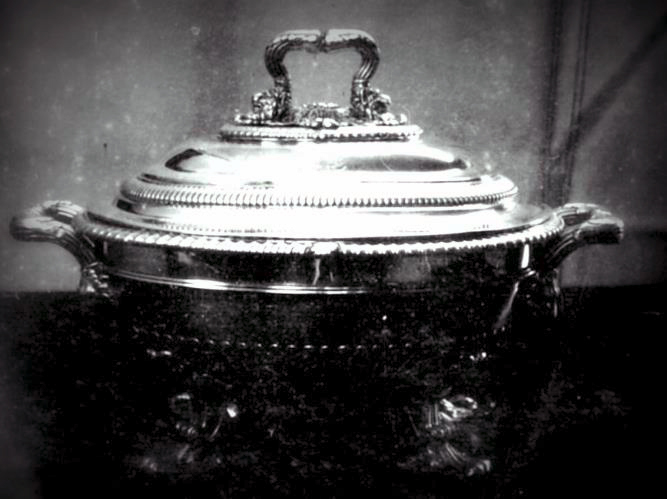 The tureen, presented to the Commanding Officer and Officers, and now displayed in the Regimental Museum, is inscribed as presented by the Governor ‘and the Honourable Court of Policy of Demerary and Essequibo as a Mark of Great Respect for their uniform good conduct during the eight years they were stationed in that Colony. 1812’. How times change – at least in saying ‘thank you’! A matching tureen, maker unknown but certainly made in Dublin was purchased by the Mess while stationed in Ireland in 1818. It was sold in 2014. 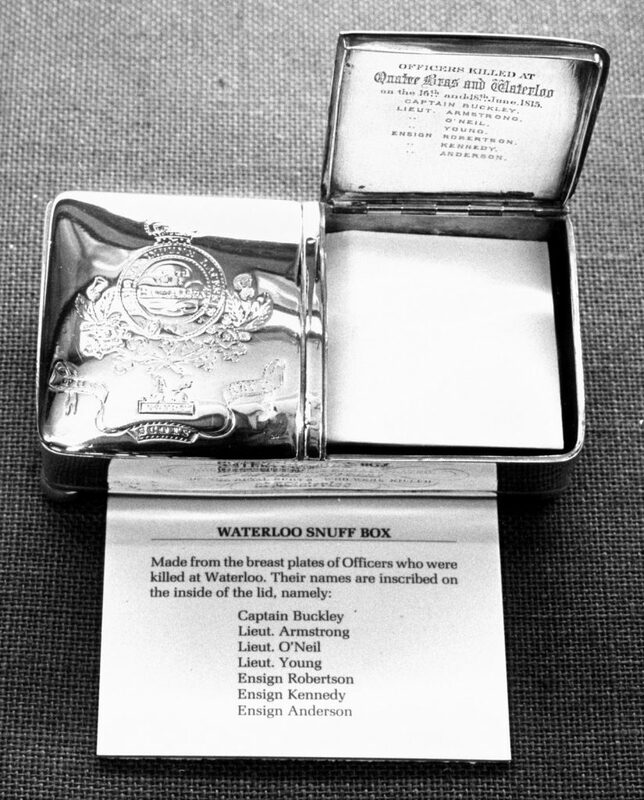 Another interesting item of silver from this period was a snuff box made from the silver crossbelt plates of the seven officers killed at Quatre Bras and Waterloo in June 1815. Much silver was purchased from the 1830s through to the 1860s, mostly for table rather than decorative use, examples being serving and entrée dishes, candle sticks, condiment sets, champagne coolers and wine jugs. A number of these items are now with 1 SCOTS. An example however, now sold, of the scale and ‘style’ of the Messes over this period were two solid silver oval venison dishes bought by the 2nd Battalion on its return to the UK, in 1831, after 30 years continuous service abroad in Egypt, Gibraltar, the West Indies and, from 1807, in India and Burma. They were made by Benjamin Smith of London and each measured 24 inches by 18 and weighed in at almost 10lbs. You can get an awful lot of deer on a dish of that size – let alone two! Ten years later these were enhanced with a pair of matching meat dishes 21 inches by 15, also by Smith, and weighing some 6lbs each. A plate fund was established by the 1st Battalion in 1878 and, soon afterwards, the decision was taken to purchase a centrepiece. In 1883 a design and estimate was obtained from Hunt and Rockall of Bond Street, London. Designs sent to Barbados in January 1884 were approved, but the work was put in abeyance due to the imminent move to Bechuanaland, and the order was not confirmed until 1890. It was completed in August 1892 at a cost of around £600, at least £65,000 today – if you were able to find a silversmith to make it. 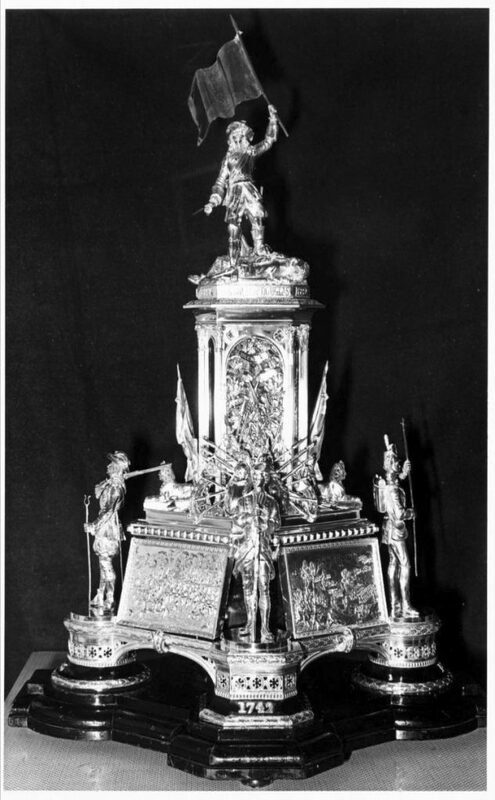 The centrepiece (see Front Cover and left on next page) stands some 40 inches high and was designed to illustrate the history of the Regiment up to that time. At the top is a group representing Sir Robert Douglas’s recovery of the Colour at Steenkirke in 1692. Round the base are four figures illustrating the uniforms and weapons of 1625, 1685, 1742 and 1813. Each figure can be detached and mounted separately on its own ebony plinth. Between the figures are four panels, chased in relief, representing four of the Regiments most celebrated battles: Blenheim, 1704, where both the 1st and 2nd Battalions distinguished themselves; and three of the great battles of the Napoleonic wars, in each of which the 3rd Battalion played a major role, Corunna, 1809, San Sebastian, 1813 (where the storming twice, the second time successfully, of a breach in the City walls is generally considered to be the Regiment’s greatest single feat of arms up until that point) and Quatre Bras (the prelude to Waterloo), 1815. The centre pillar has four Sphinx at its base marking the 2nd Battalion’s success in the Egyptian campaign against Napoleon in 1801. 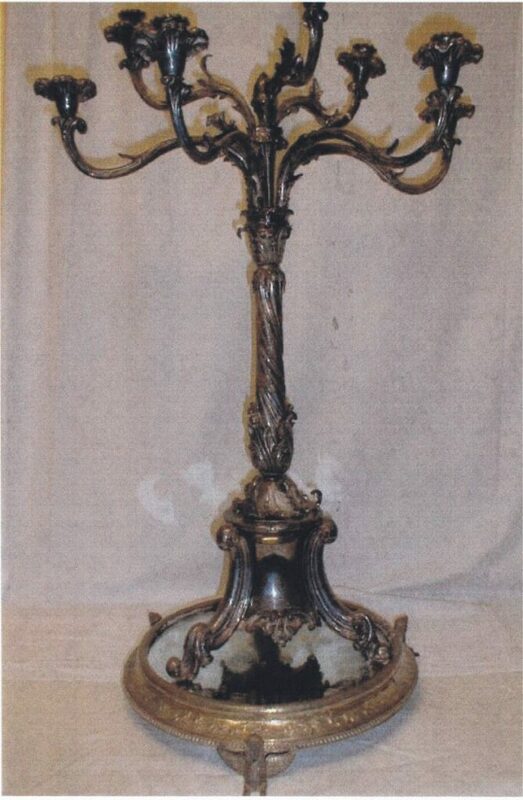 The 2nd Battalion Battalion Centrepiece (above right) took the form of a 10 branch ‘Waterloo’ Candleabra on a mirror base with Sphinx feet, made in the 1830s by Benjamin Smith, possibly for a private owner, and presented to the Battalion in 1871 by Lt Col Lawrence McGuire. Detail is at Serials 072 and 132. Another interesting item from the same period was the Drum Major’s staff, always known because of its length and the figure of St Andrew at the top as ‘Big Andy’. The story is that, while trekking from Enshawe to Pietermaritzburg in 1888, on the conclusion of the operations in Zululand, an idea for a new Drum Major’s staff occurred to Captain Cecil Daniel. During that march Captain Daniel produced sketches of his idea which were given approval. Hamilton and Inches of Edinburgh were commissioned to design and manufacture the staff which was delivered to the 1st Battalion, at a cost of £48, in 1890. The staff was some 6 foot 6 inches long and was surmounted by a 9 inch figure of St Andrew, making an overall length in excess of 7 feet, considerably taller than any Drum Major who ever carried it! 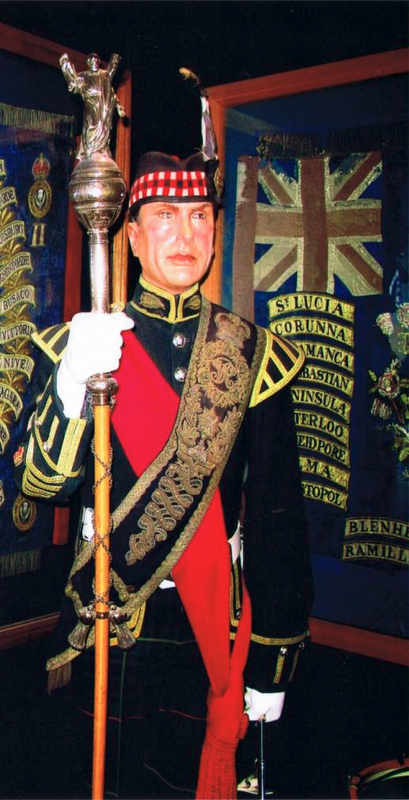 The original, shortened, but still just over 6 foot overall, is now in the Regimental Museum having been replaced in 1986 at a cost of £4,800, exactly 100 times the cost of ‘Big Andy’, by a new, model of a height of only 5 foot 6 inches – perhaps it should be known as ‘Little Andy’! From the later part of the 19th Century and into the 20th Centuries, the direction changed from the functional table silver to more decorative items such as rose bowls, tankards, sporting cups and trophies, often presented by individuals rather than purchased by the Mess. It also saw the arrival of statuettes commemorating particular wars or operations, often funded by the officers who had been involved, such as the 1st World War Soldier (below left), bought out of the Polo Fund and on the right of the front cover, or the Northern Ireland statuette (below right) paid for by the Captains and Subalterns who served there on the four OP BANNER tours in 1970-72. 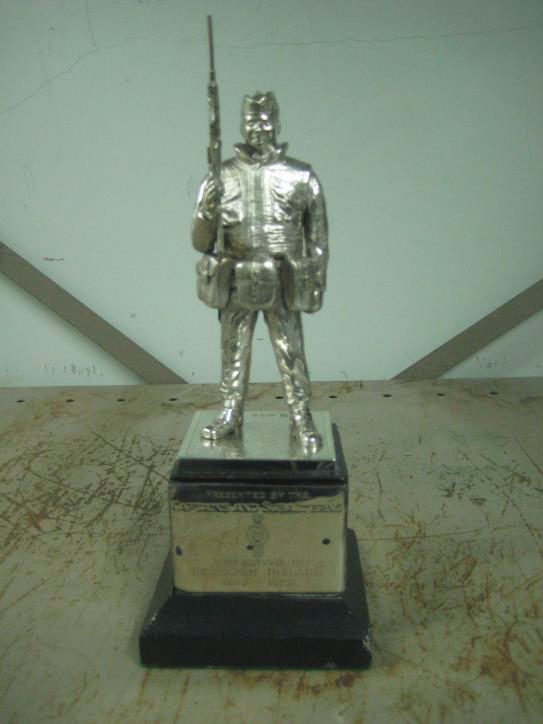 The oldest statuette, and the author’s favourite piece of Mess silver until it was stolen in 1987 en route to be repaired, was that of a Royal Scots Mounted Infantryman in the Boer War presented by the officers of the 1st Battalion who served there (see the left of the front cover). 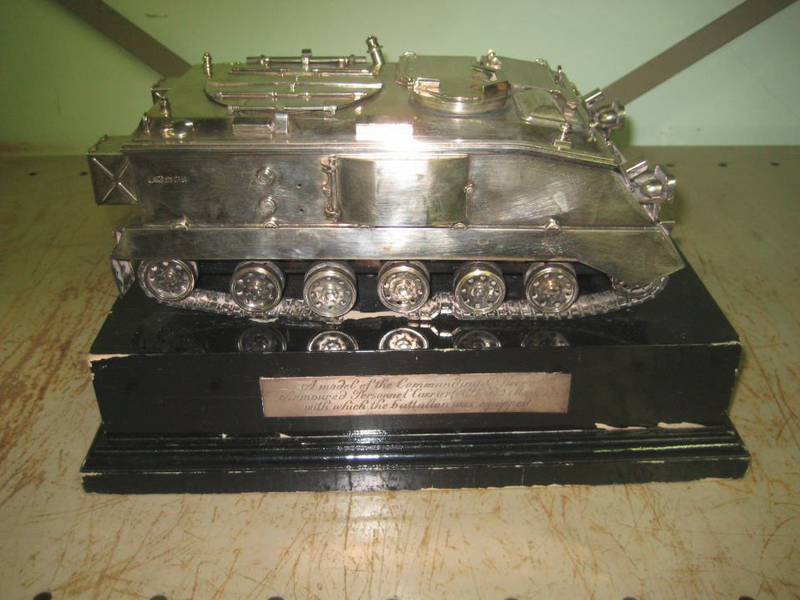 A more modern reflection is in the silver model of a 432 Armoured Personnel Carrier (below centre) the original of which was bought to mark the fact that the 1st Battalion in 1966 was the first infantry battalion to convert direct into tracked APCs. 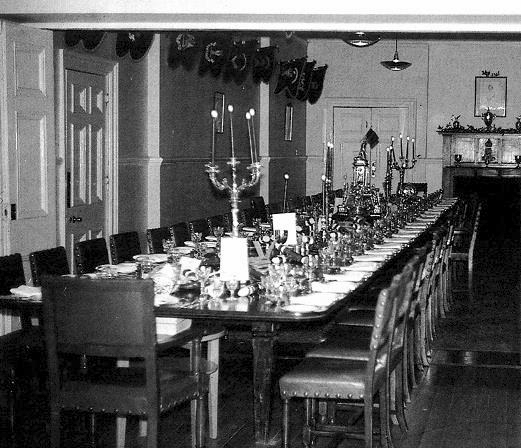 At some stage, and probably soon after its return to the United Kingdom from Canada in 1816, the 1st Battalion Officers’ Mess acquired a large mahogany dining table but its origins remain obscure. The Minute Book mentioned at the beginning of this short paper records in an entry dated Glasgow, 20th April 1838, ‘That a Slab, half the size of one of the slabs now belonging to the Mess Table, should be procured.’ The obscure origins of the table led to speculation that it had been an article of loot. The most popular theory on this line was that it had been taken by the 3rd Battalion from a Portuguese or Spanish Monastery in the Peninsula. Nobody, however, has yet come up with an explanation as to how the Battalion would have moved such a large piece of furniture around with its very limited, mule drawn transport and, in particular, over the mountains in which much of the campaign took place. Lieutenant General Sir Edward Altham, Colonel of the Regiment at the time, attempted to resolve the issue in a letter to the Regimental journal, The Thistle, in 1935. Unfortunately there is no mention of such a purchase in the Minute Book – but then there is no mention of the purchase of other items, such as pieces of silver, either. Whatever, the table has survived within the Regiment for what, now, must be close to 200 years. When the author first joined in Tripoli in early 1962 it was one of the duties of the Orderly Officer on a Tuesday to give the table a weekly polish with beeswax and vinegar, no spray polish in those days! When packed in its specially made crates for a Unit move it weighed several tons and for some weeks after arrival in the new station the table was being constantly re-levelled with the use of sheets of folded newspaper between the support frame, which had suffered over the years, and the table slabs. All this passed into history, however, around 1977 when the Battalion was stationed in Munster. The RAOC (now RLC) Major who commanded the local Base Ordnance Depot was a Scot and a keen piper. He became a great friend of the Battalion. Within his Depot he had a team of highly skilled German joiners and polishers, together with a stock of good wood. The table disappeared into his Depot and re-appeared some months later with a completely new support frame and the top beautifully French polished – all for a case or two of whisky. I hope that this little booklet and the information within it, will be of interest to present and future generations of Officers of 1SCOTS ‘and friends of the Regiment’.and that they will enjoy and draw inspiration, as much as we did, from the silver, paintings, pictures and artifacts given into their care by earlier generations of Officers of The Royal Scots. 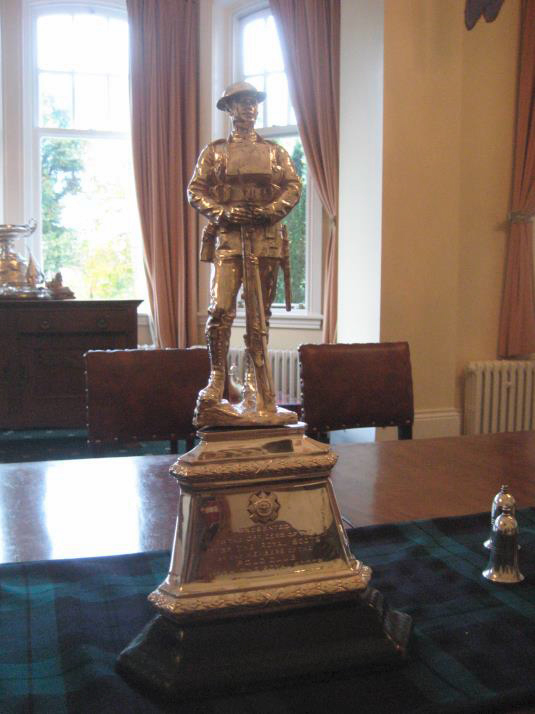 If the reader has a question on a particular item of Royal Scots silver please contact The Regimental Museum. A copy of the booklet may be found here.